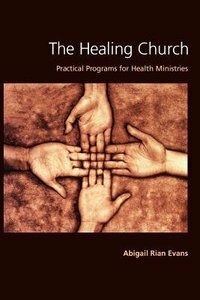 "Dr. Evans has written a balanced, persuasive prescription for promoting health in the church's healing ministry. She skillfully blends historical and theological scholarship with practical applications that will encourage churches to restore their historic tradition of healing." Abigail Rian Evans is the Charlotte W. Newcombe Professor of Practical Theology and academic coordinator of field education at Princeton Theological Seminary. She founded and directed (1983-1991) the National Capital Health Ministries program in Washington, D.C. and served on the Clinton Health Care Task Force (1993). Abigail Rian Evans is Charlotte W. Newcombe Professor of Practical Theology and Academic Coordinator of Field Education at Princeton Theological Seminary in Princeton, New Jersey. She founded and directed (1983-1991) the National Capital Health Ministries program in Washington, D.C., and served on the Clinton Health Care Task Force (1993).